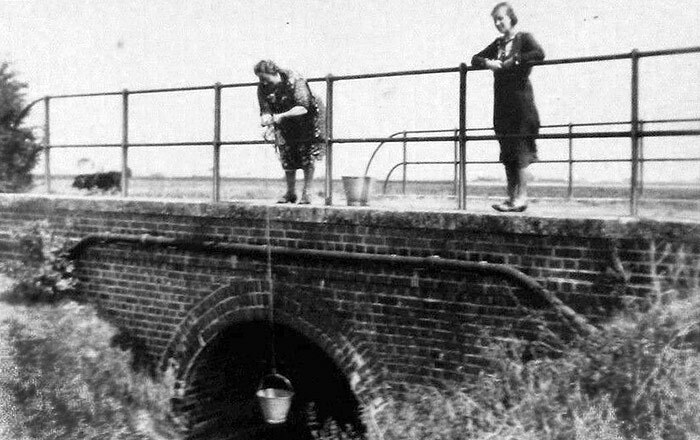 A lovely August 1933 image of two ladies, marked on the back of the print as “Mrs Wilson & Lily”, retrieving water from Horseshoe Bridge on Peterborough Road in Crowland. The bridge still exists today albeit the adjacent Horseshoe Farm has gone. The two ladies would have been 62 year old Elizabeth Ann Wilson who was the wife of a labourer at the farm and her 20 year old daughter Lily Wilson. The photographer also comments that the waterway below, known as Old Pepper Lake, had previously been used to transport a bell to Crowland Abbey albeit the size and location of the drain would make that claim hard to believe !